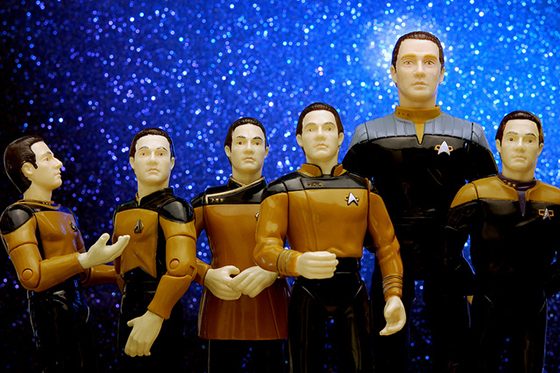 Which blog post topics will resonate most with your audience? The answer’s in the data. Image by JD Hancock via Flickr. The screen is blank. Your hands hang motionless over the keyboard. It’s time to write… about something. Every content marketer knows this feeling. It’s that moment of uncertainty at the beginning of the writing process. Is this topic really worth writing about? Will my audience care? What do they really want to read? Marketing is a test of empathy. The better you are at getting into the heads and hearts of your audience, the more successful you’ll be. And the first test of empathy is finding the topic. Luckily, it doesn’t have to be a shot in the dark. As a content marketer, you can take the guesswork out of the process by using data-driven empathy: using analytics to get into the heads of your visitors and find topics they care about most (and the topics that will convert). Here are three ways to pull blog post topics right out of your Google Analytics account – so you can write blog posts that are sure to resonate with your audience. 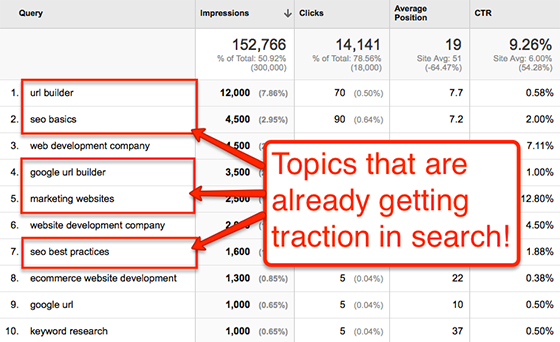 Your Google Analytics account is filled with ideas for topics. Let’s start with the big picture. First, let’s see what topics are already getting traction. In Google Analytics under Behavior > Site Content > All Pages, you’ll find a list of all your pages. If your blog is in a directory or subdomain, it’s easy to filter out the non-blog pages. By default, the data will be sorted by number of Pageviews. It’s tempting to decide that since some pages are being seen more than others, those are the topics your audience loves most. But that might not be a good idea. Some of these posts might rank and get lots of visits from search every day. Others might have been shared by an influencer with many followers. Some might have had a clever click-bait headline. There are too many outlying variables that can skew this number. 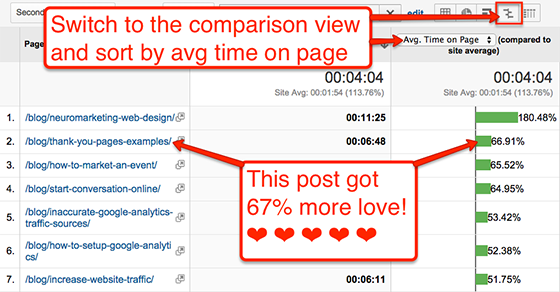 I recommend using Average Time on Page as the best way to measure how much love there is for the post, and therefore the topic. It’s not a perfect metric, because it’s affected by content length, formatting and the use of media, like video – but it’s a great start in understanding your readers’ interest. First, switch to “Comparison View” and select “Average Time on Page.” This will compare the average time on the page to that of the overall site. After sorting the report, you can quickly see which posts outperform the others. Then remove any outlying factors. For example, that top post in this screenshot has an average visit of 11 minutes, but that’s probably because it contains a 14-minute video. Eliminate any posts that have elements that might skew the data, and you’ll be left with a list of posts that your audience is really connecting with. Scan through this list and look for patterns. Are these all within the same category in your blog? Are they related to the same topics? Could you write more on these topics? Creating new content on topics that are already getting traction gives you a natural advantage. Once you’ve picked a topic that you predict will do well, be sure to employ internal linking best practices for an easy traffic boost. Looking at Pageviews to see which content your audience loves? That might not be a good idea. The report is under Behavior > Site Search > Search Terms. When reviewing the report, if the Total Unique Searches for each search term is low, expand the date range to add more data and statistical significance. Some of the search phrases will be functional, about actions the visitor wants to take (such as “jobs” or “apply”), but others will be topical, showing that visitors are looking for information on that subject. This is a great way to discover the topics that your audience is asking for – there may be topics you hadn’t even thought of! What to write about next? Your audience is telling you – you just need to know where to look. Those first two reports give you important clues into what your audience is doing on your blog – but some insights appear before the visitor has even arrived. When and how is your site appearing in Google search results? Here’s a report that will show you. Use a filter to exclude queries that include your brand name or buyer-related keywords, since we’re looking for blog post topics. In this search, I excluded the name of our brand (Orbit) as well as other buyer-related keywords. Now you’re looking at a list of phrases for which you already rank. In many cases, you may already be getting traffic from these phrases. Search for the phrases to confirm the rank and find the corresponding page. Next, think more broadly about the topic and possible related posts. Once you’ve discovered the broad topics, there’s a second step that will trigger deeper ideas. In the report above, we see that “SEO basics” is a phrase that is already performing well in search. Seeing it here is a trigger to go deeper into that topic. But what else to write about? You can use Google itself to source topics, just by entering the phrase and seeing what related phrases are suggested. After entering the phrase, type each letter of the alphabet to see what topics are suggested. It’s a time consuming process, but you can also use a tool like KeywordTool.io to do it all at once. 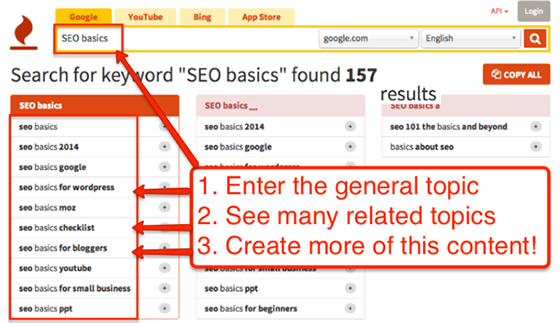 Entering “SEO basics” into this tool brings up 157 suggestions, including specific audiences (bloggers, small business) and specific formats (checklist, video/YouTube). It’s a goldmine of ideas for content marketers. Fresh out of blog post ideas? Look to your readers (and Google!) for a little inspiration. There are limits to using analytics as a source of topics. Data-driven empathy is only as good as the data – and these reports don’t have everything. It’s the offline activity that triggers the best ideas. The meetings, the phone calls, the real-world interactions with your audience. When you talk to customers and clients, prospects and partners, you can hear the hopes and fears in their voices. No report will tell you how they feel or which topics will inspire readers to keep coming back for more. Analytics is a wonderful source of ideas – but listening is the ultimate source of inspiration. Now it’s your turn. How do you source ideas for your content? Andy Crestodina is the Strategic Director of Orbit Media, a web design company in Chicago. You can find Andy on Google+ and Twitter.